After a disappointing loss at Notre Dame, the Jackets’ offense plans to get on track this weekend versus Duke. Tech had a chance to burst onto the scene with a statement win but had an extremely difficult game solving Notre Dame’s defense. Saturday marked one of the worst offensive performances in recent memory for Tech. The players and coaches echoed that sentiment. The team had to replace some key players but returned four out of five starters on the offensive line. Despite being one of the most experienced lines in the country, the veteran group still struggled on Saturday. Frustrations from the offense showed all game as mistake after mistake left the team unable to get into a rhythm or keep any kind of positive momentum. Some of the difficulties the offensive line and other players had blocking could be attributed to Tech’s first two opponents of the year being just not very good, but credit has to be given to Notre Dame and their defensive staff. “Give [Notre Dame] credit. They played well. We played horrible. I don’t know if we can play any worse, especially offensively. That’s for sure,” Johnson said. Earlier in year, Johnson repeated that the team isn’t as good as they think they are right now, and players weren’t recognizing their mistakes due to demolishing their first two opponents with little effort. Against Notre Dame, Tech started the game 0-9 on third down conversions with an average distance of 9 yards to pick up a first down. That is unheard for a Johnson-coached Tech offense, as the team led the nation last year at converting third downs. Their 60 percent conversion rate was one of the best recently. With new faces at A-back and B-back, Johnson is not satisfied with the results from the backs yet. Graduate transfer Patrick Skov starts at B-back, but being the most utilized back is still new territory for him. Inexperience has started to be felt in regards to the passing game. At times, Notre Dame stacked the box and dared Tech to throw. Tech did not a complete a pass until the second half, which is concerning due to the run game struggling as well. Unfortunately, the Jackets will be without leading wide receiver Michael Summers against Duke. True freshman Brad Stewart will get the start in replace of Summers, and Johnson raved about Stewart’s physicality in the Notre Dame game. Going into the Duke game, the team will look to recapture the performances they had on offense at the end of last year and before Notre Dame. Duke will be no easy task as they were the lone team to beat the Jackets last year at home and held them to a season-low 25 points. Johnson called Duke’s defense this year the best they’ve had in his time at Tech. 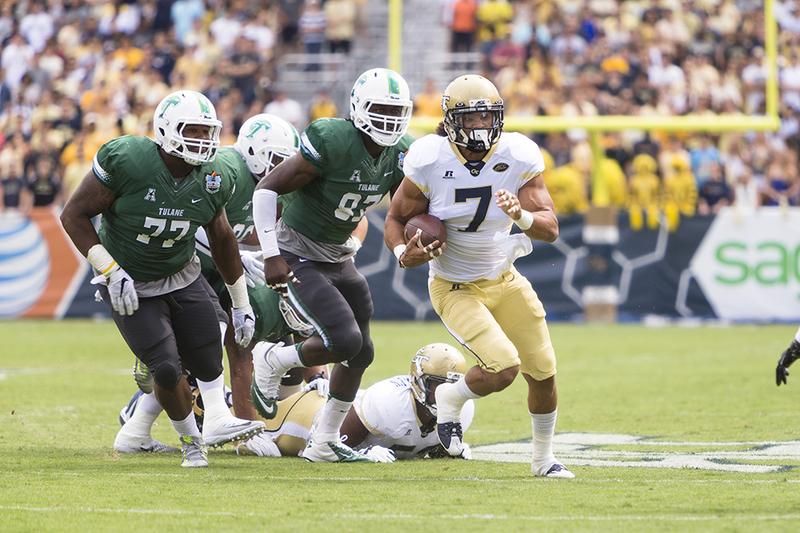 Tech and junior quarterback Justin Thomas will have their work cut out for them this weekend. After a tough game, Thomas will look to get back to his usual self. Recently, he’s had some problems pitching the ball that he will look to correct, and coaches want him to be calmer and not get frustrated during the game. “There’s a lot of things fundamentally he needs to do to get better. You start pressing, and usually when that happens it gets worse. We’ve got to help him more. The guys around him got to help him more. He can’t win the game by himself,” Johnson said.